It’s so cold today ! In celebration of Gopher Tortoises, I thought I’d share with you – 40 facts about this amazing species! Gopher tortoises are land based creatures and cannot swim. 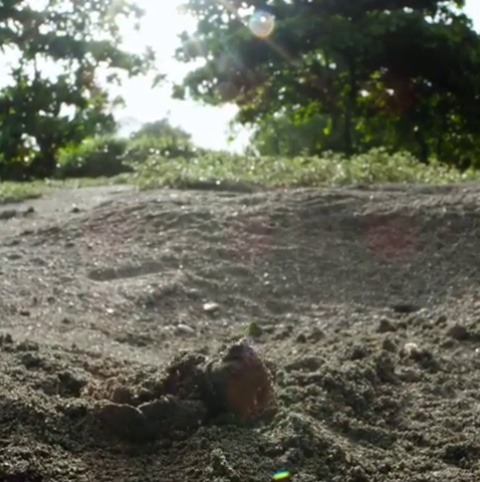 Gopher tortoises dig burrows in the ground, typically from 15 to 30 feet in length and around 6 to 20 feet deep. The gopher tortoises spend about 80 percent of their time underground. Burrows protect the tortoise from predators and extreme temperatures. Gopher tortoise dig and use several burrows and are known to occupy the same burrow for months or years in a row. The majority of the remaining gopher tortoises in the USA live in Florida. Gopher tortoise are native to southeastern USA. Gopher tortoise is considered a keystone species because the borrows they dig provide shelter to at least 360 other species of animals such as mice, frogs, and snakes. Both the tortoises and their burrows are protected by Florida State law. Property owners must obtain permits before relocating any gopher tortoises. Before any land is cleared or developed the gopher tortoises must be relocated. The Florida gopher tortoise is listed as threatened. Under the Endangered Species Act“threatened” is defined as “any species which is likely to become an endangered species within the foreseeable future throughout all or a significant portion of its range”. Front legs of gopher tortoises are flattish and make great shovels for digging burrows and hind legs are more like mini-elephant legs, round and sturdy. 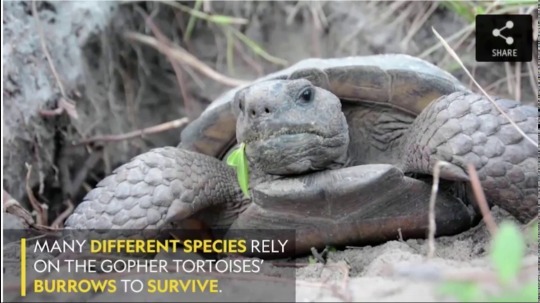 Gopher tortoises live anywhere from 40 to 60 years in the wild but may live decades beyond 60 years and researchers are unsure of their true longevity. The oldest known gopher tortoise is Gus, age 96 (as of Nov 2018) and he lives in Halifax Nova Scotia at the Museum of Natural History. Ancestors of the gopher tortoise lived 60 million years ago. Gopher tortoise are slow to reach sexual maturity, females mature between 9 – 21 years of age and males mature around age 9 – 18. Gopher tortoises are herbivores, feeding on low-growing plants, mostly grasses and legumes. Mating season is from April to November. Gopher tortoise eggs develop in the uterus for approximately 60 days. Eggs are laid out in the open, usually close to the burrow, but not always. Hatching time is approximately 80 to 100 days. Only one clutch of eggs is produced each year, consisting of 5 – 9 eggs. Larger female gopher tortoises produce larger clutches. Although they usually produce one clutch per year, females may not produce a clutch every year. Once they hatch, baby gopher tortoises must survive on their own, parents offer no support to their offspring. Only 3 – 5 percent of young tortoises survive, the rest are gobbled up by predators. Main predator to adult gopher tortoises is humans, with most killed by vehicles, sold as pets, or killed for food. Gopher tortoises are not swimmers! In the animal world their main predators are opossum, raccoon, skunk, fox, coyote, domestic dogs and cats, snakes, and birds. Habitat destruction is a primary threat to gopher tortoises. Of the five North American tortoise species of genus Gopherus, the gopher tortoise is the only one found east of the Mississippi River. Gopher tortoise shell is oblong shaped and generally brown, grey, or tan in color. It is illegal to hunt gopher tortoises or possess their meat or shells. The scientific name for gopher tortoises is Gopherus polyphemus. The gopher tortoise stays in its burrow when temperatures are below 50 Fahrenheit (10 Celsius). When temperatures are above 90 Fahrenheit (32 Celsius) the gopher tortoise will be less active. Gopher tortoises are diurnal, they come out of their burrow during the day to eat and bask in the sun. Gopher tortoises are typically solitary animals. Although solitary animals (yeah solo travelers!) gopher tortoises live in groups called colonies, with sub-groups called pods. From the 1800s to late 1900s the gopher tortoise population was depleted by 80 percent, mostly due to humans. In Florida more than 80 percent of gopher tortoise habitat is owned by corporations and private individuals. More gopher tortoise facts! You can never know enough! Trust me.. if you think you know enough you’ll get this particularly good Gopher tortoise side eye! That’s right! Today, April 10th, is Gopher Tortoise Day! The Florida Gopher Tortoise is an incredible creature whose existence has been seriously impacted by urbanization, disease, poaching, and other human actions. According to national geographic, their numbers have declined by 70 PERCENT in the last century! That’s a frightening loss for the species and for the 360+ other animals whose own existence rely on the burrows Gopher tortoise create! The video above features one of the most outgoing tortoises Hipps’ observes regularly, Gertrude. In the article, she describes Gertrude as an alpha female and discusses the social behaviors she and her fellow researchers have observed while studying them. “Most of the tortoises are pretty shy and skittish, but not Gertrude,” says Hipps. If someone approaches Gertrude’s underground home she often begins to head-bob—a telltale sign of tortoise aggression—before charging forward and possibly ramming your shoes, she says. Read all about the gopher tortoise research project, Amanda Hipps’ work, and the other tortoises her team has worked to learn about and protect in this fantastic article by national geographic. I guarantee you’ll learn something new! Oh, and please take a moment and check out this incredible twitter thread by Amanda Hipps, who researches the animals that live in gopher tortoise burrows! It will blow your mind! An understanding and respect for Gopher Tortoises and the creatures that depend on them is a must for everyone but especially those who live among them. This year, Sanibel island joined the many cities that celebrate Gopher Tortoise Day, by sharing information and advocating for conservation awareness. “The species needs plenty of sandy sunny habitats with an open tree canopy to thrive and survive, according to the FWC. Officials advised that it is best to leave gopher tortoises and their half-moon shaped burrow entrances alone. It is illegal to disturb or harm them, their burrows or their eggs. So take some time to learn about the gopher tortoise today, about their impact on the environment around them, and how you can help ensure the species exists for many more Gopher Tortoise Days to come! And if you’re interested in the research mentioned above? Consider Following Amanda Hipps (@biophiliamanda) and Bethany Augliere (@BethanyAugliere) on twitter! You’ll learn so much! Yep its Gopher Tortoise day again and we’re excited to share some of our previous posts about these amazing shell friends. Not only are they incredible all on there own, but they also create homes for 300+ creatures that need their burrows to survive. The look of devastation and betrayal at finding out your snack isn’t romaine lettuce. Does anyone else have a tortoise that’s extremely picky? Like, if it’s not crunchy she refuses to eat it. She went on a hunger strike for three days once because my fiance bought collards instead of romaine.